One of my jobs today was to check and fill mineral feeders and put out salt blocks for the cattle. On a ranch cattle eat grass as their main source of nutrient intake. However, we don’t just turn the cattle out and expect everything to go perfectly. There are many companies that produce mineral products for cattle to ensure we all have a product that works for our environment. On our ranch we utilize the Wind and Rain mineral from Purina. Cattle have specific nutrient requirements, just like any animal or person. When we supplement consistent mineral intake for our cattle we support healthy hair coats, bone and muscle development, immune function, skin and foot health, the nervous system, appetite, fertility, fetal development, and milk production. Essential macro minerals for cattle include phosphorous, potassium, calcium and magnesium. Micro minerals needed in cattle diets include copper, zinc, iodine, selenium, manganese, and cobalt. 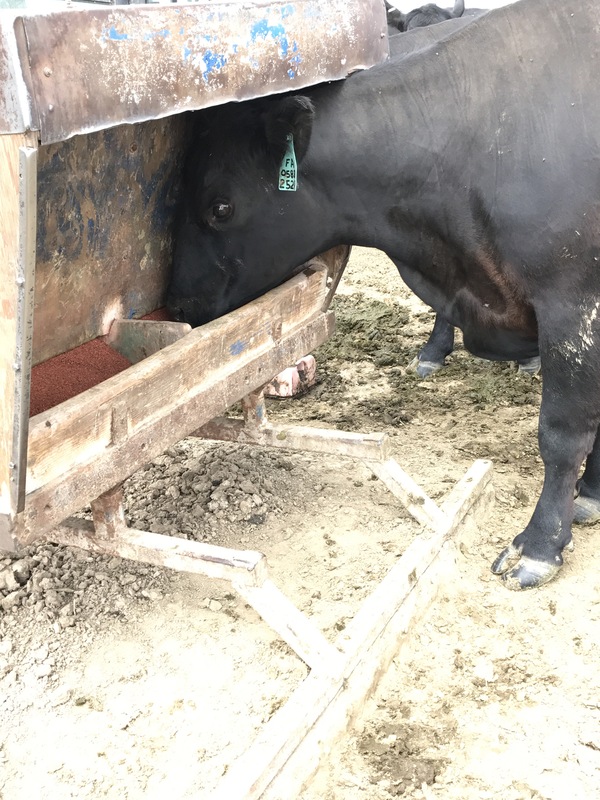 When a free-choice mineral is placed in feeders for the cattle they consume what they need to meet these mineral requirements. We place minerals in the cattle pastures in feeders that we built especially for this purpose. They cover the mineral to protect it from the weather while still being easily accessible to the cattle. Cows reach into the feeders with ease whenever they need minerals. Along with the minerals we place blocks of iodized salt out with the cattle because it is also important to their diet. Cattle will lick the blocks as their bodies tell them they need salt, all we have to do is ensure that they always have access to a salt block and the mineral feeders are full. While the cows receive these supplements we also have specific blocks for recently weaned calves, bulls being developed for our sale, and heifers preparing to have their first calves. As cattle producers, we take special interest in the nutrient needs of our animals and put time into ensuring that the supplements being used are exactly what the herd needs.